What If Your Audio Mix Just Doesn’t Sound Good? All your chosen hardware is in place and working well. You are hard at work mixing your audio project. But the end result is disappointing. It just doesn’t sound that good. What’s wrong? It may have nothing to do with your gear. Could the problem be pilot error? While unpleasant to consider, audio engineers do make mistakes. Before you blame that !#%*$ console, Sweetwater Sound, a pro audio dealer, suggests looking inward. Return to the basics. In many cases, Sweetwater suggests a first step is to strip the mix to its essence and then examine the individual components. Ensure that all the parts are as good as they can be, then start building the mix again — with a mental picture of what you want the result to be as your guide. Always start with high-quality audio material. Perhaps this is a no-brainer, but it’s entirely possible that poorly recorded sound may be the issue. Garbage in — garbage out (GIGO). If the content is music, make sure all the instruments and vocals are in tune and there’s no excessive frequency clustering. If it’s a voiceover, make sure the audio is cleanly recorded to start with. A good recording is essential to a good mix. In the basic mix, you’re developing a mental picture of your final mix. In the cognitive sciences, this is called structural visualization. It’s an aptitude shared by not only sound engineers, but professionals ranging from architects to astronauts. You can think of your mix in terms of a three-dimensional universe with height, width and depth. That universe is populated with objects — instruments, vocals and effects. Each has a frequency range (height), stereo pan position (width) and relative volume (depth). Thinking about these elements this way will yield more interesting mixes with dimension, detail and impact. Hollywood film mixing soundstages are calibrated for 85dB and remain there, so re-recording engineers have an absolute reference and are never misled by fluctuating monitor levels. In accordance with the Fletcher-Munson curves, 85dB is where frequencies sound flattest. Scale of common sounds and pressure levels. Click to enlarge. Loud playbacks accentuate the human ears’ perception of bass and treble frequencies and consequently tend to make mixes sound punchier than they really are. Conversely, quiet monitor levels attenuate the extremes, leaving the midrange. Mix with loud monitor levels, and often you end up with a puny mix. Monitor too quietly, and the mix will have tons of top and bottom and vocals and other midrange instruments won’t be loud enough. 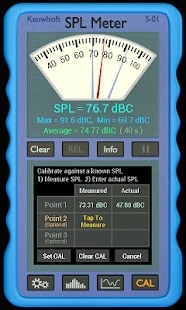 SPL Meter. Click to enlarge. Most pros get an SPL meter and calibrate their monitors. Of course, 85dB is a good starting point, but in smaller rooms, this may be uncomfortably loud. Having a reference in the range of 70dB–80dB in such cases is fine. Doing critical mixing at your established reference level goes a long way to achieving a consistent and good-sounding mix. Finally, healthy monitor levels are only a start. Humans ultimately deal with the perception of sound. Our ears need to be optimized for monitoring accuracy. After 15 hours of constant work, a mix is finished and often sounds good. Play it back the next day and it sounds absolutely terrible. Why is this? Ear fatigue is the most likely culprit. Just as loud monitoring fatigues the ears, so too does critical listening at nominal monitoring levels for hours on end. Take breaks, give your ears a rest and know when to call it a day. Go back fresh the next day. The mixes will not only sound better, but you’ll be avoiding potential hearing damage that could cut short your career. Pros know this. Better learn it before you are sorry. Audio mixing is not just about choosing the right gear. It’s about developing the skill set to use it correctly and to take care of our human ability to hear sound well. That’s what establishes a long and fruitful audio career. It seems as time goes by, more audio interfaces come on the market. The choices are now more abundant than ever. Yet, finding the right interface for a given application is a far trickier issue.